This post is lovingly dedicated to stepfather, who seems to have a real love affair with butter. I have seen him on several occasions eat it sliced on crackers like cheese – it’s amazing. Don’t get me wrong, butter is totally a delicious indulgence for me once in a while, but we all need to be aware that it is one of the most concentrated forms of animal fat that makes us, well, fat too. Since the last post, which included butter beans, I experimented with the ones left over from the salad recipe. Pondering over their creamy texture and rich flavour, I came up with this simple alternative spread to butter! Now obviously beans will never be butter, nor can you cook with them like butter, or bake with them like butter, but you can whir them up with a few other ingredients to make something worthy of your most discriminating cracker. Butter beans, also referred to as lima beans, are a total super food. They are loaded with protein (much like other legumes), and when eaten in combination with whole grains and whole grain products they provide the protein comparable to that found in meat or dairy foods without the high calorie content or saturated fat. And when you eat butter beans instead of animal products, you also experience the health benefits of dietary fiber, which lowers cholesterol, stabilizes blood sugar, prevents constipation, but also helps prevent digestive disorders like irritable bowel syndrome and diverticulosis. Just one cup of lima beans will give you 65.8% of the daily value for fiber. This recipe is incredibly versatile, so I have just laid out a basic version for you to experiment with. Because this is essentially a bean dip, you can add as many flavours as you like – try roasted garlic, fresh herbs, spices, chilies, steamed vegetables, other oils (flax, for example would be a great choice! )…the list goes on as far as your imagination. I chose to put in a few pinches of turmeric because it turns the dip a slightly yellow colour, just for kicks! It does not add any flavour, but as a bonus turmeric’s anti-bacterial properties help to retard food spoilage, for a longer life in the fridge. Pretty neat, eh? You can use canned butter beans if it’s all you have available, but the flavour is far superior when you cook them yourself. 1. Soak beans for 8 hours (or overnight) in pure water. Drain, rinse well and place in pot with enough water to cover them by a few inches. 2. Bring to a boil, lower to simmer and cook for 45 minutes, or until tender. 3. Drain and rinse. Allow to cool. 4. Place cooled beans and other ingredients in a food processor and blend until smooth and creamy. Done! 5. Refrigerate leftovers. Keeps for about a week. And I couldn’t help but include this picture. 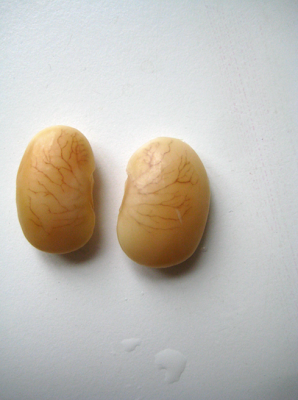 The other day as I was rinsing off my beans after cooking, I noticed the veins running though them so closely resembled lungs! Wow! Just when I think food has amazed and inspired me to very the limit, it pulls out one more jaw-dropping detail that brings me to my knees. this sounds really amazing and I will try it. But I have a question: Can I use this “butter” for baking? I am not so sure this would work in a baking situation, since butter adds fat and this recipe is very fiber-dense. They act very differently! You could always try with a half batch and see, but I would be nervous to make a cake with it, for example…let me know how it goes! I’m very gratefull for have found you and your blog. Yet another AMAZING recipe by Sarah B.! I added some fresh basil leaves and tarragon and it was fantastic!! This is so clever! I just might have to try this tomorrow! What a great idea! I love baby lima beans (and I do love butter). I should try this. I love what you said about the “jaw-dropping details” in food/nature that “brings you to your knees”. I had a similar experience when I first sliced into a kiwi (we didn’t have it growing up) and was just amazed by the sunburst-like detail, the black seeds against the bright green… Aaaah nature at its best. Thank you for sharing your “discovery”! ha! great photo of the two beans. Well shot. and i love that last photo. incredible! SF – Sarah thanks for the ‘dedication’. Love the real thing but I’ll try yours. Great observation. Lovely photo. It is fascinating what one can see when looking very closely at things in the kitchen. wow that photo is amazing.